First detected in some foods in 2002, acrylamide is a substance formed in high-carbohydrate, low-protein foods that have been cooked at very high temperatures. Note that it is not something added to foods; rather, it forms in certain foods after cooking. Thsi substance has raised some interest because some studies show that animals fed high levels of acrylamide developed cancer. Many ongoing studies are investigating whether low levels found in foods poses a health risk to humans. The highest levels are found in french fries and potato chips; it has also been detected in some cereal products, toast, and coffee but at much lower levels than what is found in potato chips. Generally, the cooking methods associated with the formation of acrylamide are roasting, baking, and frying. Boil or steam potatoes; the cooking temperatures in these two methods are not high enough for the acrylamide-producing reaction to take place. Do not store potatoes in the refrigerator because it may result in higher levels of acrylamide formed during cooking. Store them in a cool, dark place such as your pantry. Cook only until the potatoes turn a golden yellow color instead of brown (the darker areas contain more acrylamide). In the same vein, toast bread to the lightest acceptable browning level, and discard any dark or burned crust. Use a maximum temperature of 350F for frying and 450F for baking potatoes. The FDA also provides acrylamide data on individual food products. 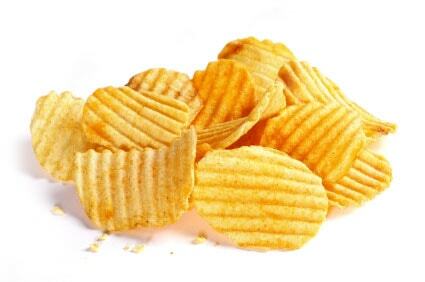 While there is no need to panic or wage an all-out war against acrylamide, it is still a good idea to limit your intake of potato chips and french fries in general. These two foods (particularly the pre-packaged/frozen versions) tend to be deep-fried and high in salt and/or artificial seasonings, so they should not be regular features on your plate regardless of the acrylamide levels. To address the occasional craving, make them yourself from scratch and follow the guidelines provided above. (Note the tremendous value of cooking at home; you’re in control of what you add to the food and how it gets cooked). And finally, let’s put this in context: if you eat a wide variety of vegetables and fruits you will naturally limit the amount of processed potato products (or any other highly-processed foods) your body gets anyway.